­Bluetooth takes small-area networking to the next level by removing the need for user intervention and keeping transmission power extremely low to save battery power. You're on your Bluetooth-enabled cell-phoned, standing outside the door to your house. You tell the person on the other end of the line to call you back in five minutes so you can get in the house and put your stuff away. As soon as you walk in the house, the map you received on your cell phone from your car's Bluetooth-enabled GPS system is automatically sent to your Bluetooth-enabled computer, because your cell phone picked up a Bluetooth signal from your PC and automatically sent the data you designated for transfer. Five minutes later, when your friend calls you back, your Bluetooth-enabled home phone rings instead of your cell phone. The person called the same number, but your home phone picked up the Bluetooth signal from your cell phone and automatically re-routed the call because it realized you were home. And each transmission signal to and from your cell phone consumes just 1 milliwatt of power, so your cell phone charge is virtually unaffected by all of this activity. It provides agreement at the protocol level, where products have to agree on when bits are sent, how many will be sent at a time, and how the parties in a conversation can be sure that the message received is the same as the message sent. The big draws of Bluetooth are that it is wireless, inexpensive and automatic. The other way to get around wire is Infrared communication.Still it has two problem. Bluetooth is intended to get around the problems that come with infrared systems. The older Bluetooth 1.0 standard has a maximum transfer speed of 1 megabit per second (Mbps), while Bluetooth 2.0 can manage up to 3 Mbps. 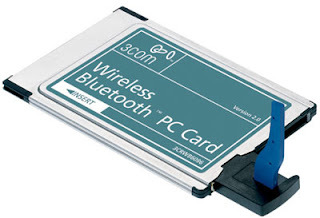 Bluetooth 2.0 is backward-compatible with 1.0 devices. Bluetooth networking transmits data via low-power radio waves. It communicates on a frequency of 2.45 gigahertz (actually between 2.402 GHz and 2.480 GHz, to be exact). This frequency band has been set aside by international agreement for the use of industrial, scientific and medical devices (ISM). A number of devices that you may already use take advantage of this same radio-frequency band. One of the ways Bluetooth devices avoid interfering with other systems is by sending out very weak signals of about 1 milliwatt. By comparison, the most powerful cell phones can transmit a signal of 3 watts. The low power limits the range of a Bluetooth device to about 10 meters (32 feet), cutting the chances of interference between your computer system and your portable telephone or television. Even with the low power, Bluetooth doesn't require line of sight between communicating devices. The walls in your house won't stop a Bluetooth signal, making the standard useful for controlling several devices in different rooms. Bluetooth can connect up to eight devices simultaneously. With all of those devices in the same 10-meter (32-foot) radius, you might think they'd interfere with one another, but it's unlikely. Bluetooth uses a technique called spread-spectrum frequency hopping that makes it rare for more than one device to be transmitting on the same frequency at the same time. In this technique, a device will use 79 individual, randomly chosen frequencies within a designated range, changing from one to another on a regular basis. In the case of Bluetooth, the transmitters change frequencies 1,600 times every second, meaning that more devices can make full use of a limited slice of the radio spectrum. Since every Bluetooth transmitter uses spread-spectrum transmitting automatically, it’s unlikely that two transmitters will be on the same frequency at the same time. This same technique minimizes the risk that portable phones or baby monitors will disrupt Bluetooth devices, since any interference on a particular frequency will last only a tiny fraction of a second. When Bluetooth-capable devices come within range of one another, an electronic conversation takes place to determine whether they have data to share or whether one needs to control the other. The user doesn't have to press a button or give a command -- the electronic conversation happens automatically. Once the conversation has occurred, the devices -- whether they're part of a computer system or a stereo -- form a network. Bluetooth systems create a personal-area network (PAN), or piconet, that may fill a room or may encompass no more distance than that between the cell phone on a belt-clip and the headset on your head. Once a piconet is established, the members randomly hop frequencies in unison so they stay in touch with one another and avoid other piconets that may be operating in the same room. Let's check out an example of a Bluetooth-connected system.